Find this book at Amazon.com | buch7.de | eurobuch.com | buchhandel.de | books.google.com ASIN=0940262185, Category: Philosophy, Language: E, cover: PB, pages: 124, year: 1995. 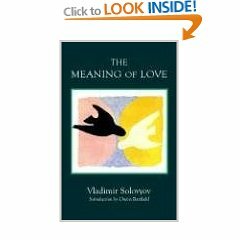 "Solovyov's essay of the "Meaning of Love" is the most outstanding of all his works and even the only original expression about Eros-Love in the history of the christian thought. [...] Solovyov is the first christian thinker, who actually acknowledged the indvidual and not only the sense of genus of love between man and woman." -- Nicholas Berdyaev, The Russian Idea, 1946.
Who would have suspected to find the term "gravitational pull" combined with "aspiration" in this book? (p107), as well as words like "atoms" and "immaterial matter" on the following pages? Although I've not yet understood everything he writes, -that remains for the re-readings (plural! ),- rarely I've read a more profound book which left me with higher aspirations out of admiration for the grace that potentially we got the chance to discover the secrets of life and cosmos. This little book's title suggested it already: there's actually a meaning in love; especially revealing is the relation between faith and love. It would seem that the title's subject couldn't be profoundly discussed on 101 pages, but Soloviev actually and miraculously achieved it. 3) a happy love, if it is very powerful, likewise usually remains unfruitful. 1) The relation must be heterosexual, quote (chap 3.i): that one must (be able to) physiologically posses the loved person. 2) Man and woman must live together in conjugal union, quote (chap 3.i): that we must live together. The additional condition, in conjugal relation, follows later in the book. 3) The man being the lawmaker: "That the male represents the active and the female the passive principle, that the former ought to exert an educational influence over the character and mind of the latter-these, of course, are elementary propositions." "In a true marriage the sexual union is not destroyed but modified;" [...] "The main meaning in this relation belongs to the middle element — the love exaltation or the patos of love. The man sees his natural complement, his material other —the woman— here not as she appears to him (and as the others who are not involved see her) through external observation, but he see through into the true being or its idea, in that, to which it was determined to be from the beginning, as it was seen be God in eternity and what it definitively should be. Hereby is attributed to the material nature in its highest individual expression —the woman— in reality a unconditional meaning, the woman is confirmed as a moral person, as goal per se or as a being, which is able for spiritualisation and 'divinisation'. From such an acknowledgment results the moral obligation to act thus that in this real women and her life is realized, what she should be. To this relates the character of the higher sentiment of love for the women, who sees in her chosen-one a true savior, who should discover and realize *for her* the sense of her life." "In regard to the female complement man (the man) is consequently not per se the creative, formative principle, but mediator or leader of the divine force." What is true art? That's one of the topics in Solovyov's writings about "The Philosophy of Love" of which "The Meaning of Love" is one part. According to Soloyov, art is nothing but "the sense-perceptible presentation of whatever object under the viewpoint of its finalized state, or what is the same, in the light of the higher world, in which mankind and with him the whole creation find again their lost homeland. 'Ars est artium, ars amoris*'." For another explanation, what art is, see e.g. : Joseph Beuys' book "What Is Art? : Conversation with Joseph Beuys". Note, one of the key phrases in Beuys book is the name Rudolf Steiner, referring to Steiner's book "Threefold Social Order" which inspired Beuys. *) "The art of love is the arts of arts" is a quote from Ludovicus van Leuven, Amoris divini et humani antipathia (1629). "This perfection, which for us is still only being realized, is for God, i.e., in the truth, already real. That ideal unity towards which our world is aspiring, and which constitutes the end of the cosmic and historical process, cannot be only someone's subjective understanding (for whose, pray, is it? ); truly it is like the external object of Divine love, like His eternal other." For your question, it is referring to the "subjective understanding". i.e. if it is subjective - then whose i.e. who is the subject as in simple English it translates to ( whose understanding, please tell me is it then ? ). So author is indirectly saying that it is an objective understanding that "Perfection is already real for God." or God is already perfect. Actually, this para is very profound and points us to the fact that the aspiration of the world is unity with the truth (God) and is the purpose of life (i.e. end of the cosmic and historical process" in author's word). What your man Solovyev means is that the 'ideal unity' is not one's person's understanding, because ultimately who would that independent 'other' be? I.e. he is suggesting that at a certain point separation dissolves and there is only object, or oneness! Interestingly, though, Solovyev appears to be seeing the cosmos, and everything in it, as one whole but god as a separate entity to it ... what about God as the Cosmos?? What is the meaning of love's intense emotion? Solovyov points to the spark of divinity that we see in another human being and shows how this "living ideal of Divine love, antecedent to our love, contains in itself the secret of the idealization of our love." According to Solovyov, love between men and women has a key role to play in the mystical transfiguration of the world. Love, which allows one person to find unconditional completion in another, becomes an evolutionary strategy for overcoming cosmic disintegration. Vladimir Solovyov (1853-1900), one of the greatest philosophers of the nineteenth century, was the founder of a tradition of Russian spirituality that brought together philosophy, mysticism, and theology with a powerful social message. A close friend of Dostoevsky, a Platonist, and a gnostic visionary, Solovyov was a prophet, having been granted three visions of Sophia, Divine Wisdom. He was also a poet and a profoundly Christian metaphysicist. His most important works include Lectures on Divine Humanity; The Justification of the Good; and War, Progress, and the End of History.